The Black Bear is an intelligent animal, with the ability to remember food locations and can quickly become accustomed to human sources of food. People who feed bears are creating problems for everyone. 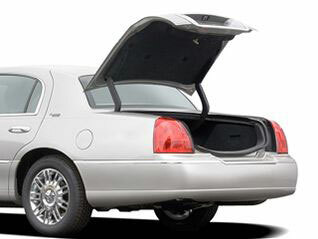 Developed Areas - In developed campgrounds and picnic areas, store all your food (including pet food) inside the closed trunk of your vehicle, if possible. Do not store food, cooking utensils or fragrant items, such as soap, toothpaste, or shaving cream in your tent. Store your food and other bear attractants in the trunk of you car in developed campgrounds and at picnic areas. Please remember to close the trunk! Backcountry - When camping in the backcountry, put all food in a pack and hang it well off the ground, and away from the vicinity of your tent. The pack should be at least 4 metres (~13 feet) off the ground and 2 metres (~7 feet) away from the tree trunk. It is also wise to hang your pack away from your sleeping, cooking and eating areas. When in Algonquin Park's backcountry place all food and other bear attractants (soap, toothpaste, etc.) 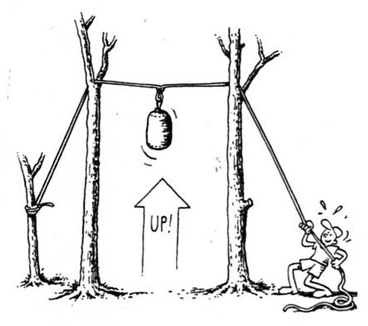 in a pack or stuff sack and hang it well off the ground [at least 4 metres (~13 feet) off the ground and 2 metres (~7 feet) away from the tree trunk] using one of these two methods below. In developed campgrounds, reduce the availability of garbage, and consequently garbage odours, by depositing your garbage daily in the bear-proof waste containers. Clean your picnic table and barbecue after every use, and be sure any spilled grease is cleaned up. When camping in the backcountry, burn any food scraps and fat drippings (no plastics, styrofoam, or aluminum foil) thoroughly in a HOT fire. Any remaining garbage should be placed in your litter bag and suspended along with the food. To eliminate food odours, dishes should be washed immediately after each meal (preferably well away from your campsite). Most human-bear encounters result in no damage to property or harm to people but bears are powerful animals and the potential for damage or injury must be taken seriously. 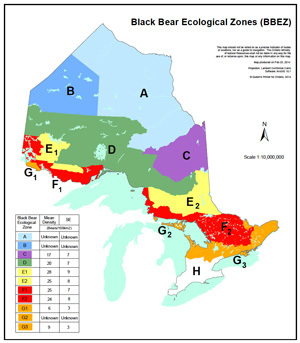 Although Black Bears are reasonably common in Algonquin Park, with the population thought to be around 2000, there is no particularly good place for them and you will have to be very lucky to see one. Bears, like most animals, constantly look for food. Since bears will hibernate and not eat for up to five months during the winter, they need to find enough food during the rest of the year to restore their fat reserves. Black Bears most often eat nuts, berries, vegetation, or insects and grubs found by ripping apart rotting logs. Their diet can also include young deer fawns, moose calves, spawning suckers, or any carcasses they may find. Bears are normally shy of humans and quickly get out of your way. However, if they've had luck finding food at campsites, some bears lose their fear and start visiting campsites regularly looking for something to eat. These "campsite" bears can become persistent and destructive nuisances. Fortunately, human-bear encounters are rare in Ontario. Increasing your awareness about the importance of a clean campsite, proper disposal of garbage, and what to do when a bear does get too close will help ensure your camping vacation is a safe and memorable experience. 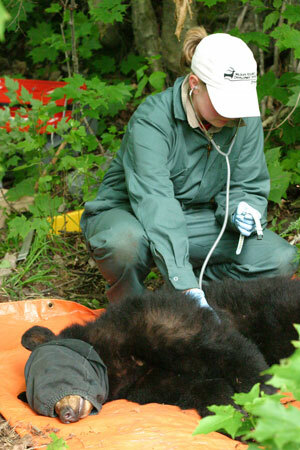 Each year, Park staff spend hundreds of hours dealing with problem bears. As visitors camping in bear country, you have a responsibility to follow the bear rules and to know what to do if you encounter a bear. If you encounter a Black Bear it is likely to react in one of four ways. In most cases, a bear will hear or smell you before you are aware of it. Even if you surprise a bear, it will most often flee the area. Reacting to a fleeing bear... Enjoy the fleeting sight of a wild Black Bear. Some bears lose their fear of humans from frequent human contact or from being rewarded with human food or garbage. These bears may not respond to our attempts to dissuade them and may react defensively. Reacting to an Habituated Bear... Stay calm and determine if the bear is aware of you. If the bear is unaware of you, move away quietly. However, if the bear is aware of you, talk to the bear in a low tone, wave your arms, back away, and leave the area. If you are near a building or car, get inside as a precaution. If the bear was attracted to food or garbage, remove it after the bear leaves to discourage the bear from returning. A defensive bear will respond in a defensive manner if it perceives you as a threat or if it is defending a food source. It may use vocalizations such as huffing, blowing air loudly through nostrils, exhaling loudly and "popping" of teeth, and may swat the ground with its fore paws, lowering its head, and drawing back the ears. As well, a defensive bear may resort to bluff charges. The bear is feeling threatened by your presence and is trying to get you to back off. Reacting to a Defensive Bear... Stop and face the bear. If you are with others, stay together and act as a group. 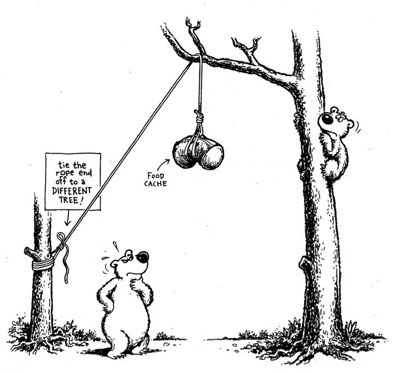 Make sure the bear has a clear escape route. Slowly back away while watching the bear and wait for it to leave. Use a whistle or airhorn, or bear spray if you have them. Do not turn and run - this may trigger a predatory response in the bear. Do not climb a tree - bears are excellent climbers. On EXTREMELY RARE occasions, a bear will attack humans with the intent to kill. Predatory bears seldom make huffing or "popping" sounds, nor do they swat the ground with their forepaws, or bluff charge as defensive bears sometimes do. Instead, they silently stalk, or press closer and closer to their intended prey, apparently assessing whether it is safe to attack. Reacting to a Predatory Bear... Leave the area in your canoe or car if you can, but never turn and run. If you cannot leave, confront the bear. Do everything in your power to make the bear think twice about attacking you. Be aggressive, yell, throw rocks, hit the bear with sticks, and use your whistle, airhorn, or bear spray if you have them. If a predatory bear does make contact with you, do not play dead. Fighting back with everything you have is the best way to persuade a predatory Black Bear to halt its attack. Should you have an encounter with a bear, advise Park staff or the nearest Park Office. Bear spray is pepper spray with a strength, and a propellant, specifically formulated to deter bears when it is sprayed in their eyes. Know how to properly use, store, and carry this product. Keep in mind that bear spray is no replacement for appropriate conduct in the outdoors. Keep your dog away from any bears. In some cases, dogs may nip at a bear and then run back to their human masters with the bear in pursuit. Remember dogs must be on a leash when in a provincial park. Carnivore, omnivore, or herbivore? Despite its size and power, the feeding habits of Algonquin's largest predator, and the distances it travels to find food are quite remarkable. Research on Black Bears in Algonquin has shed some light on the dietary needs and movements of the Park's second largest animal. To delve into the fascinating world of the Black Bear, check out The Science Behind Algonquin's Animals.